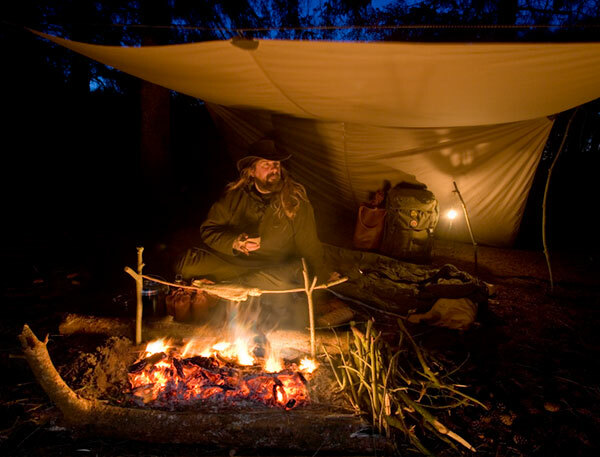 Ravenlore Bushcraft and Wilderness Skills. Cooking on an open fire. All too often I have seen people trying to cook over a roaring fire and having a great deal of trouble too. If you think about the size of fire you cook on at home (a gas or electric hob probably) you will soon realise that a small fire is going to be much easier to cook over. 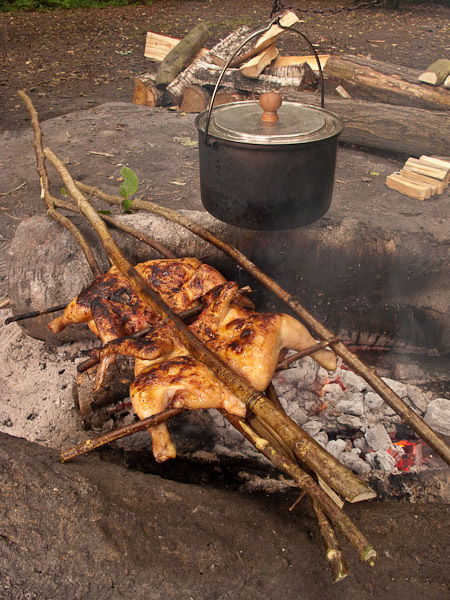 If you are forced to cook over a fire larger than you need, try to make a small area in the side of the fire that you can control more easily. 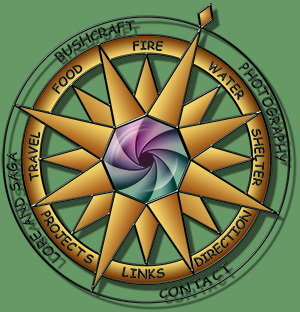 A vital point I will raise is, think very carefully about the site of your fire, do not light a fire in close woodland, on dry peat or in areas where open fire is prohibited. In these areas you should use a stove instead. Sometimes a site may have a fireplace that has been used before, if this is well established and in regular use then it may be suitable for use again. Try to avoid making new fire scars. In some of the pictures seen here the fire was built on a pile of stones above the ground surface that had been used for a number of years. It still required rebuilding to reduce it’s size and cleaning out before I used it. I also removed a small satellite fire place that had recently appeared to give the ground a chance to recover. In all other places you should aim to leave no trace of your fire when you leave. When I am laying out a fireplace, I usually do not use a ring of stones, it is unnecessary, it restricts the air flow and it is not a low impact approach. I do sometimes use two or three stones that can be laid in the area I want to cook in to act as a pot rest. Always make sure such stones are not waterlogged as the heat can cause such stones to burst with violent force. If such stones are unavailable logs can be substituted but will mean your cooking should be done before they burn away. The amount of cookware your carry will depend on how much you want to carry and the type of food you wish to prepare. 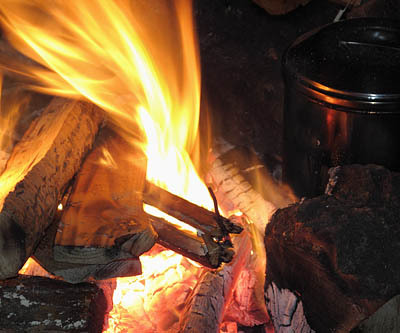 Above you can see a small billy can in the side of the fire for boiling. My usual cooking set varies according to need but if you want to go lighter you can boil in a metal cup and roast on just a skewer. 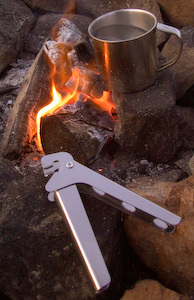 If you are intending to boil with a metal cup it is wise to carry a pot grip to move the cup in and out of the fire. I find a wooden spoon to be a very useful item when cooking. My own spoon which is longer than a normal eating spoon also has graduations marked on it to measure quantities in the billy can. Skewers can be cut from green sticks but a metal one weighs next to nothing and is often more reliable. Don’t forget to insulate the ends of the skewers or use a glove to move them about if they have been over the fire for any length of time. Green sticks can also be used to support heavier items of food by “ponassing” and this suits filleted fish and spatchcocked foul very well. I’m not going to say much about ingredients in your cooking because your tastes will probably be different from mine. I do carry a few condiments and essentials in my kit and they often repay their extra weight with the pleasure of a good meal at the end of the day. Another useful pieces of equipment to carry that are well worth their weight are a blow poker and a small chain for hanging my billycan. On occasions that I am working near to my vehicle, I can use a heavier fire tray which provides a much lower impact way of enjoying an open fire. Fire lighting can be achieved in many ways but I like to practice the old method of using flint and steel, not because it is any better than a match but because it is somehow far more satisfying. 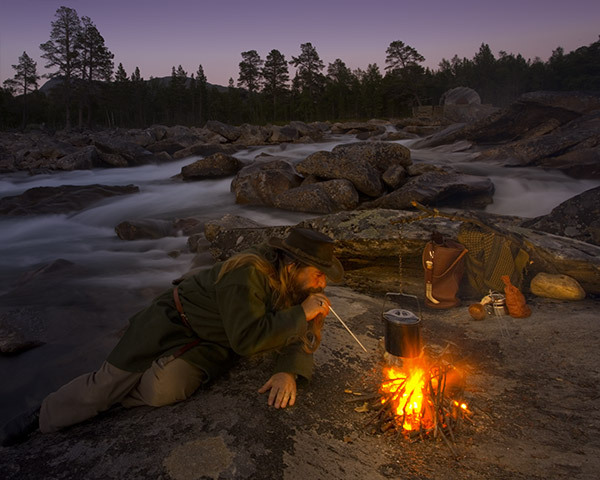 Cooking over and use of an open fire should only be done where it is safe to do so and with the permission of the land owner. In all other places, use a stove.